by Jody Espina, Founder & President JodyJazz Inc. 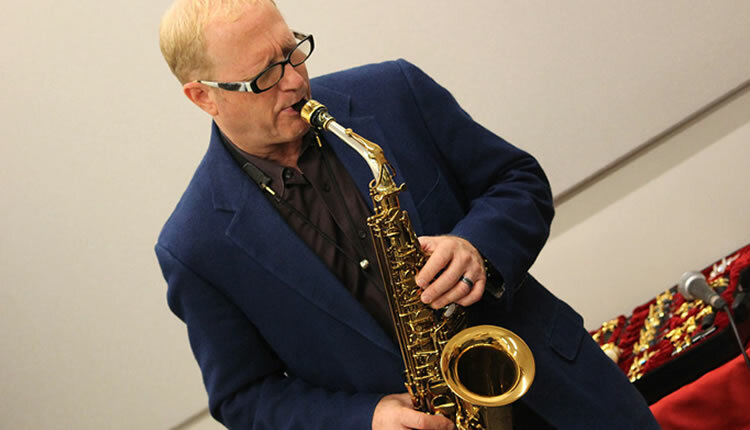 This article dedicated to any player or teacher who is interested in improvisation. Beginners will find some helpful ideas here about how to construct an interesting solo. Advanced players will probably know everything in this article, but sometimes being reminded of good ideas can freshen up our playing. We all know that an improvising jazz musician is telling a musical story. The same conventions that apply to a good novel also apply to a good jazz solo. You need an interesting premise (motif), or opening chapter. There should be character development (development of motif) as well as an interesting or satisfying conclusion. Other elements of a real page turner of a book or a captivating solo are conflict and resolution or tension and release. The intensity of a good book or a solo will have peaks and valleys. In music these exciting and calm moments can be achieved through the use of dynamics, space/rests, speed/length of notes, and the range of pitch (low/high notes). These tips are so simple and common sense that you may think that you don’t need to pay much attention to them. I believe that the players who diligently practice them will be rewarded for their efforts with more applause from the audience at the end of their solos and more respect from their fellow musicians. Some of these ideas fall under the tricks and licks category. These may take more time and practice before you’ll be able to use them in a solo, but the way a chef uses spices to give food flavor, these tricks can liven up your soloing. Important note: These tricks and licks will not make you a better player. If these are used effectively, they will may make you a more interesting or entertaining player. Fancy tricks and licks can’t replace solid fundamentals like good tone, intonation, time/swing feel, phrasing and good technique. Therefore, my recommendation is to stay with your normal practice routine and add one of these tricks at a time. Play less notes and put space in between your ideas. This may seem like a cheap trick but it’s not. This simple and easy to do suggestion will immediately make you sound better. Almost all of us including me would have more success with our solos if we would economize on notes and give the listener time to digest our ideas. A great way to practice this is to imagine that you’re trading one or two bar riffs with an imaginary player. Play something then leave the space while you imagine what the other player would play. Don’t worry about there being dead space. Most rhythm sections will jump all over those spaces and before you know it you’ll be in a real dialogue with the rhythm section. Legend has it that Miles Davis once asked John Coltrane why he was taking such increasingly long solos. Trane answered “I can’t find a way to end them”, to which Miles then responded in his raspy whisper, “Try taking the horn out of your mouth.” Space is the place – Take the horn out of your mouth. Another simple but very effective trick is to play a high note for about as long as you can hold it. Used at the right moment in your solo, this is almost guaranteed to get the crowd on your side. The shape of a solo is important. Jamey Aebersold explains this very well in Volume 1 of his play along series. For example, you can start a solo in the low or medium range of the horn and as you develop your ideas, start to play higher and higher and perhaps faster and more notes, building to a well-timed very long high note. What’s worth playing once is probably worth playing at least four times. Using exact repetitions or slight variations allows your listener to follow your train of thought better. In other words, when you play a nice lick, don’t just abandon that little gold nugget. Let us see/hear it again. Turn it around for us, so that we can get a good look/listen. Go back and listen to some of your favorite improvisers and see if there are any cases of motif and development, which usually contains a healthy dose of repetition. The tips mentioned so far are enough to change your playing dramatically. On your next solo, try and do these four simple things. Or better yet, record yourself playing a solo with a play-along or a live band. Don’t use any of my ideas. Just play as you normally would. Then record yourself while you consciously use the four ides below. – Put space in between your ideas. – Repeat and make variations on the good ideas. – Build to a climax with a long high note. – Now try and listen to both recordings as an impartial listener would. Which one is more interesting?